I just got back from an amazing conference in Thailand, focusing on ministry to countries where Christians are persecuted. Thank you for praying for me on this last trip to Thailand. God answered the prayer for divine appointments at least five times, any one of which was worth the trip. There were about 540 Christian missionaries there from 54 countries and over 100 organizations. It was truly a picture of the Body of Christ worshiping together with such a diverse group of brothers and sisters in the Lord, many of whom have been refined in the fires of persecution. The joy and sense of unity in the Spirit was strong. My seminar on InScript Bible study software was well received, and I believe will help people in getting God's Word into many more places. One of the best things about the conference was the time in between sessions, where people with problems and corresponding solutions were able to connect with each other. God is awesome in the way He brings His people together in opening effective doors to bring Good News to people in some of the most challenging places! Please keep praying for us as the Lord leads you! 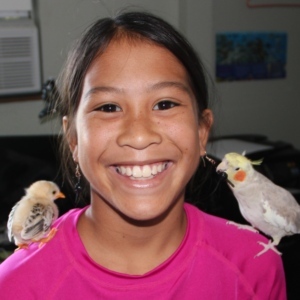 While I was in Thailand, a neighbor brought Rachel an orphan chick. Apparently, we will need a chicken coop, because that chick won't stay little for long, unlike the cockatiel on her other shoulder. 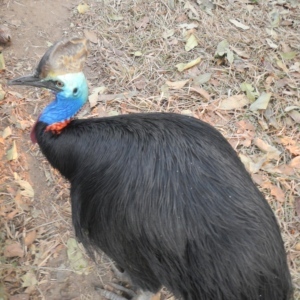 I met this cassowary in Thailand while out on a walk. I'm glad Rachel didn't find a cassowary chick while I was gone. A full-grown cassowary can kill a man when it is angry or scared. This cassowary was friendly enough, though. I think it could tell that I like birds. 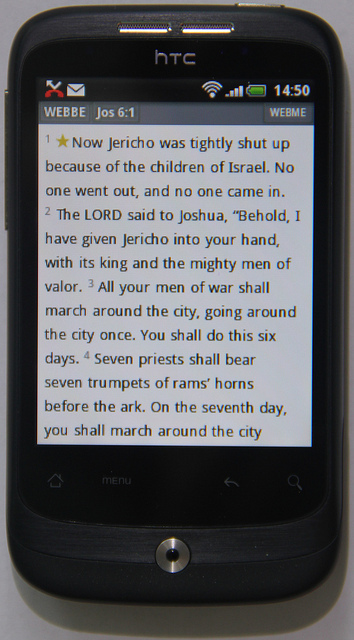 We give away free Bibles in over 636 languages. Where copyright owners allow us, these are available in many electronic formats on many web sites and via Digital Bible Society media libraries. These Bibles are not copy-protected with any sort of DRM, but freely copyable to many kinds of devices. Except for the World English Bible and its derivatives, all of these are translated by others who allow us to distribute their Bible translations. We do this because God's Word produces eternal results in people's lives. We don't require payment for any of these Bibles, but rather rely on God to supply our needs. God is well able to do that. We are truly grateful for those whom the Lord leads to support us so that we can keep doing this. We are very grateful to those Bible translators and Bible translation agencies who allow us to freely distribute their Bible translations without charge.